What a whirlwind! In just over a month, PortSide NewYork received a White House award for our Sandy recovery work, had our Founder & Director Carolina Salguero receive a National Maritime Historical Society (NMHS) award, and we were able to open the tanker MARY A. WHALEN to the public for the first time in almost three years!!! News of that NMHS award facilitated PortSide’s being able to move the tanker into Atlantic Basin, which is how, on very short notice, we could to open the tanker MARY A. WHALEN for her 75th birthday. Friday 5/17/13, some eighty NMHS members came to the MARY A. WHALEN on a NY Waterways ferry as part of a harbor tour of historic ships. Our Director Carolina Salguero spent the rest of the weekend with NMHS during their 50th anniversary celebrations and annual meeting. Burchenal Green, President of the National Maritime Historical Society, at the helm of the MARY. For inspiration about how to think of using our harbor, take a look at the National Maritime Historical Society 50th Anniversary weekend events to see how maritime people connect far flung venues - by boat! The itinerary harkens back to the “Chain of Ships” we once proposed, a series of NYC maritime destinations connected by boat. With the tanker in Atlantic Basin for the NMHS visit, we asked if we could stay two more days, which is how the ship was suddenly able to be open to the public on Tuesday, 5/21/13, the tanker's actual 75th birthday. The MARY A. WHALEN was open for public tours during a hot Tuesday afternoon, followed by a public party with “cake and remarks” from 5-7pm, with an evening after-party capping it all off. TankerTour visitors included the great surprise of crew descendants: Hans Hansen, son of the engineer Hans Hansen who worked with Alf Dyrland, the Captain for 20 years, brought the engineer’s granddaughter Ingrid Hansen for the first time since 1968. She was about 9 when she last visited and remembered that women were not welcome aboard at the time. Some things have changed! We also received visitors from PS 29, the school for whose Super Science Saturday fair we created our simple “Simple Machine” machine and installation, a highly interactive exhibit we would like to bring other schools and public events. (School staff & parents, please get in touch to help shape programs for the next year!). PortSide use of the tanker as a social mixer to bring maritime and inland people together was sure evident during the party! We had the maritime consultants, authors and artists Barry Parker, Rick Spilman & Frank Hanavan, along with community members, families with kids, and Ian Danic, a board member of River Project, with his pet giant macaws. Frank Hanavan did some turkshead bombing of our gangway rail and strung up ship flags to great effect, assisted by architect and Museum Designer Paul Alter, who peered into the cargo tanks and expressed an interest in being the man to redesign them for exhibit and function space when we're ready to do that. Also attending was the Federal Disaster Recovery Coordination team involved with New York State's Sandy recovery. We met them thanks to winning the White House award and are talking to them about how to bring resiliency preparedness resources to Red Hook. Roland Lewis lead a contingent from the Metropolitan Waterfront Alliance. Dan Wiley from US Congresswoman Nydia Velazquez' office and Jim Vogel from NYS Senator Velmanette Montgomery spent a long time with us, and we were glad to have our prospective landlord John Quadrozzi of GBX-Gowanus Bay Terminal aboard with his wife Xiomara. 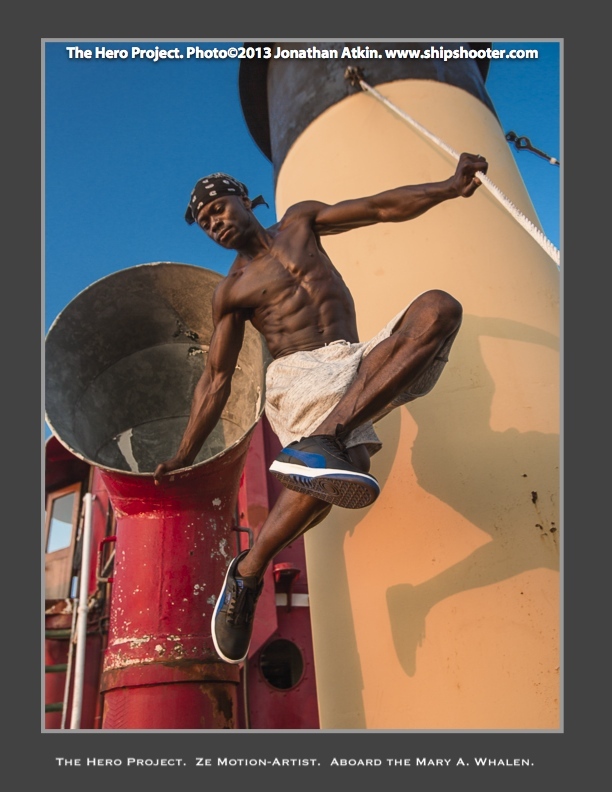 As if the macaws were not visual enough, maritime photographer Jonathan Atkin provided more eye candy by running a photo shoot with three magnificent dancers. Access limitations at our normal berth in the Red Hook containerport had prevented Atkin from getting dancers to the tanker for weeks; so with just two days notice, he assembled three of them to further his Hero Project, an inspired photo concept he created to use dancers to bring attention to the cause of historic ships. After the party shoot, one dancer tackled his bird phobia with one of Ian's macaws – the MARY A. WHALEN is consistently a place where extraodinarly things happen - and the hip hop dancer Ze Motion, who dances for Madonna and major sponsors, offered to donate a dance performance to PortSide. The tanker’s 75th, and our new website, are the occasion to introduce the new way we will refer to the tanker. We’ve been calling her “the Whalen” for short since that was what our Director Carolina Salguero first heard her called in 2001; but we have learned that all former crew members call her “the MAR,Y” and so from here on in, so shall we. That's a good lead in to note just how rare and precious the MARY A. WHALEN is as well as what PortSide has done with her. According to Norman Brouwer, a noted maritime historian, the MARY A. WHALEN is the only oil tanker in the world re-purposed as an educational and cultural center. Once the Sandy-damaged tanker JOHN B CADDELL is scrapped next month, Norman says the MARY A. WHALEN will be the last surviving coastal oil tanker in the USA. What was a sizeable fleet of coastal oil tankers, a type of vessel type which was significant to the war effort during WWII, was destroyed in the course of duty, sunk as artificial reefs, scrapped or , years ago, exported to third world countries. It's great to be a tanker! We could use our own boom to lift aboard a portasan and take it with us, sparing us the cost and hassle of having Royal Flush deliver. The tug RED HOOK approaches, makes up the tow, we haul in our shorepower cord, we pass the container ship pier of the Red Hook Marine Terminal, MV Cape Race as we enter Atlantic Basin, John Weaver attaches the shorepower cord adapter for Atlantic Basin, coming back home at dusk with Red Hook Volunteer Mike Elders on deck, crew of tug SASSAFRAS docking the MARY. Profuse thanks to the Port Authority, EDC & BillyBey for greenlighting our stay in Atlantic Basin within days. At this time, we would also like to welcome BillyBey to Red Hook as the new operator of Atlantic Basin. Our visit was their first vessel call in Atlantic Basin, and it was an auspicious start! Thanks also to Metro Cruise Services, the operators of the Brooklyn Cruise Terminal, for their help with the fencing we used during the TankerTours and tanker birthday party. Thanks to the Red Hook Volunteers for providing essential set-up and break-down labor. If you want to help Red Hook’s Sandy recovery, please come volunteer with them! Sandy-damaged businesses, home owners, tenants and NYCHA residents are still being helped by them. We only recently learned the MARY A. WHALEN's actual launch date was May 21 due to research by noted maritime historian Norman Brouwer, the man who basically wrote THE guides to historic ships and some of our national preservation standards for them. Thank you, Norman! Special thanks to Vane Brothers for donating the tow between our current berth in the containerport and Atlantic Basin!!! We were very excited to be towed to Atlantic Basin by their brand new tug, the RED HOOK, named in honor of our favorite neigborhood. Vane's NYC operations are based at the former site of Ira S. Bushey's in Red Hook where the MARY A. WHALEN first began her working life, which provides a great reminder of how the working waterfront in Red Hook has a long, and living, history - and we are part of it!